This is an experiment. 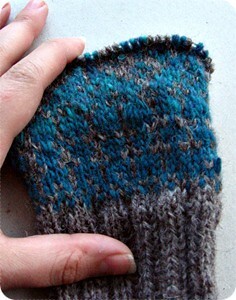 Last year I knitted a fair-isle beret which turned out to be really warm and I had been meaning to knit matching mitts. Sadly the beret was not just super-warm, it was also super-itchy, and so I never made the mitts. I decided I was going to re-knit the beret (and knit the mitts) this winter, and I uncovered yarn in my stash. Some aran-weight yarn from Blacker Designs (Norfolk Horn - not currently available) and some Noro Kureyon to go with it. I don't think the experiment is working. The two yarns are beautiful but they are not beautiful together. The Norfolk Horn yarn is too marled to show off the Kureyon and the Kureyon is too strong to show off the Norfolk Horn.The colourwork gets lost. Rip, rip, rip.. or what do you think? It is currently snowing outside and I'm about to start decorating for Christmas, so it feels wrong to say this .. but the first summer collections are beginning to show up around the interwebs. First up, Rowan. They have gone more lacy with this collection which is nice for a lacehead like me. My favourite is probably Daydream from the main magazine's Illusion story - it looks almost Victorian with its high lace collar and long sleeves. Knitted in my beloved Kidsilk Haze I'm currently trying to persuade myself that I need a Victorian-esque lace jumper in my wardrobe. Fancy, another KSH jumper, looks a bit more practical. Summers in Scotland can be quite cool, I'm telling myself.. I'm really starting catching the sewing bug too. I've discovered a couple of great sewing blogs - my current favourite is probably The Snug Bug because Patty sews up Colette patterns, models them, and looks amazing. She makes me feel like I too could look great in a Colette garment although I am not a stick-insect-thin twenty-something living in an impossibly trendy New York apartment (not to slight Colette patterns at all but some of the sewing bloggers modelling them makes me feel woefully inadequate and lumpy - it is odd that I never feel that way about knitters?). Another cup of hot chocolate beckons me, then it's time to put on some music (Sam Cooke? Voxtrot?) and then start uncovering Christmas decorations. Happy first of December..